Dundee's V&A museum has welcomed half a million visitors since it opened, reaching the milestone almost six months earlier than expected. The 500,000th person to walk through the doors of Scotland's first design museum was officially recorded at 10:35 on Saturday. It was initially forecast it would take 12 months to reach the milestone. V&A Dundee director Philip Long said: "It has been an extraordinary opening period for V&A Dundee and the support from visitors has surpassed all expectations. The museum's inaugural exhibition, Ocean Liners: Speed and Style, was seen by 95,766 people. Culture Secretary Fiona Hyslop said: "V&A Dundee is a powerful symbol of Dundee's new confidence and is not only raising the national and international profile of the city but is increasing Scotland's attractiveness to tourists looking for world class cultural experiences. "It's fantastic to see V&A Dundee breaking visitor numbers six months earlier than predicted, showing the incredible success of this prestigious new attraction and that there is a real interest in Scottish design. "I congratulate those involved in making this such a valuable asset to Scotland in both cultural and economic terms and I look forward to seeing it continue to delight visitors for decades to come." 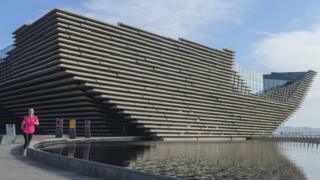 Dundee City Council leader John Alexander said: "This is an incredible achievement for V&A Dundee in such a short time. "We can see from the increased visitor numbers at other Dundee attractions that the city is certainly feeling the benefits of the opening of this superb new museum of design. "Everyone is looking forward to the unveiling of V&A Dundee's new exhibition and partners in the city are working towards maximising the continuing opportunities for the area from these visitor numbers. "This is just six months since the museum first opened. I can't wait to see what happens next."